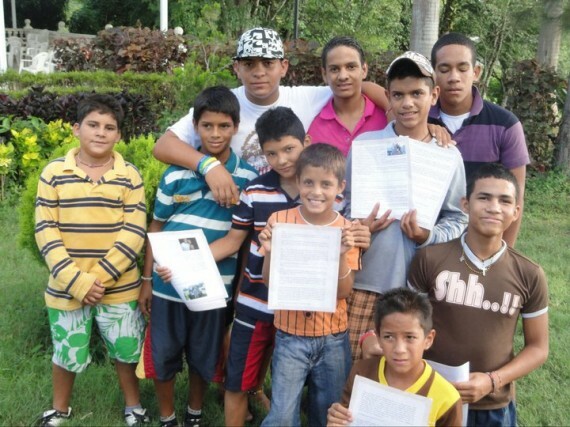 On the 3rd day of our trip, I was inspired to get some of the readers here to write a letter or 2 to these boys, to give them some encouragement as they go through the program over at Project Jonas. You can read about it a little more here, and here. This was definitely an example of that. Although sending us these pictures was not necessary, we are and will be eternally grateful to have played a small part in each of these boys lives. To all the people who wrote, thank you so very much. Enjoyed browsing through these pics. Thanks for sharing, Ben (and for the opportunity). Their faces are priceless! I really like the one where Italo’s reading to Deivis, it just goes to show what these boys mean even to the local church. Au contraire… Thank you Ben. You took a nudge and made it personal and even invited us to be part of it. That’s great. I basically said, “watch out for the dude with the shovel. He’s actually looking for Venezuelan Gold” LOL. Thanks for being a part, and thanks for bringing in more people! The kid with the “shh” t-shirt is totally cracking me up! Looks like it was a great experience for them. I didn’t even think twice until you pointed it out, LOL freakin hilarious, especially even more so that I actually know him (Aaron). What a great experience – thank you for bringing us through the door of your journey.